The workplace is full of files that capture your best ideas or your team’s most productive collaborations. But those files aren’t useful if you’re unable to access or share them effectively. That’s why, just two years ago, we introduced Google Drive. Today more than 190 million people actively use it at home, school and work. Drive keeps all your work safe, and makes it available everywhere and easy to share. Companies around the world like Crate & Barrel, Seagate, Tory Burch, HP and Jaguar Land Rover rely on Drive to work faster and collaborate better with their coworkers and customers. But we’ve also heard from businesses that they want more control and security, visibility into how files are shared, and a product that will grow with them. So we’ve been working to make Drive even better for business, and today at Google I/O we announced Google Drive for Work — a new premium offering for businesses that includes unlimited storage, advanced audit reporting and new security controls for $10/user/month. 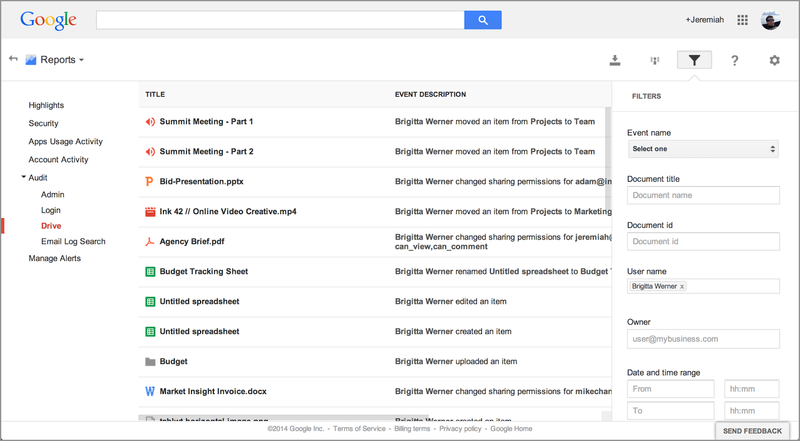 Google Drive for Work combines the familiar storage, sync and share experience of Google Drive with new admin controls, advanced file audit reporting and eDiscovery services. New fine-grained controls let admins customize the Drive experience, such as which employees can install the desktop sync client. With the new audit view you can see activity like moving, deleting or sharing a file within or outside the company, and an audit API will also be available for developers. Google Apps Vault, our solution for search and discovery for compliance needs, is also included with Drive for Work, expanding to cover all content stored in Drive, including Docs, Sheets and Slides, as well as any other file type. Every year companies create more data than the last, adding megabytes, gigabytes and terabytes. Well, today, we’re taking bytes out of the conversation. For $10/user/month, businesses get unlimited storage for all their employees and can store files up to 5 TB in size (To put that in perspective, no desktop or laptop on the market today even has a hard drive big enough to capture and store a file that size). As of today, all files uploaded to Google Drive will be encrypted, not only from your device to Google and in transit between Google data centers, but also at rest on Google servers. Some of the most common file types stored in Drive are Microsoft Word, Excel® and PowerPoint® files. We’ve now built the power of Quickoffice into Docs, Sheets and Slides, so you can open and edit those documents in their native format using Office Compatibility Mode directly on Android and Chrome browser today, and coming soon to iOS. No need to buy additional software or decide how to open your file. 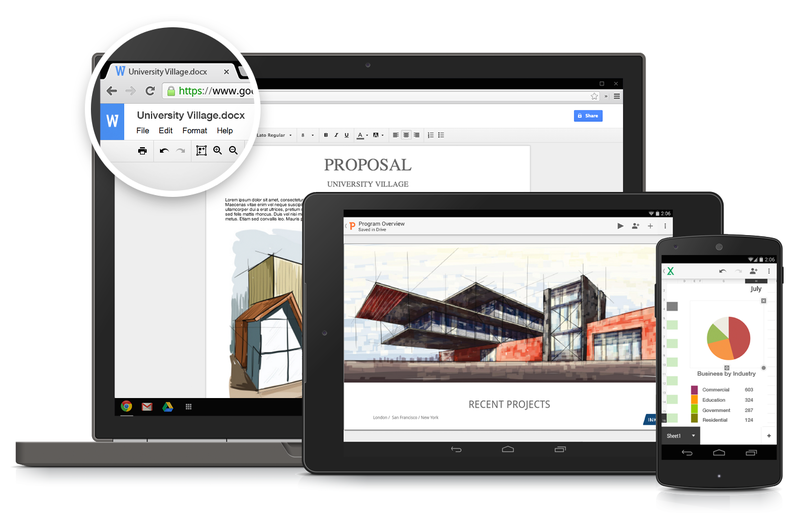 Editing Office files is just a click or tap away from Drive on your computer, tablet or phone. Google Drive for Work includes the benefits and guarantees of Google Apps for Business, like 24x7 phone support and a 99.9% uptime guarantee. You also get access to all of Google’s productivity apps like Docs, Sheets, Slides, Sites and Hangouts, so you collaborate in even more ways. Drive for Work also offers enterprise-grade security and compliance, including a SSAE 16 / ISAE 3402 Type II, SOC 2-audit, ISO 27001 certification, adherence to the Safe Harbor Privacy Principles, and can support industry-specific requirements like HIPAA. Drive for Work is available globally, today. If you’re a current Apps customer you can upgrade from the Admin console to get new features like unlimited storage. If you’re new to using Google at work you can learn more about Google Drive for Work on the web, or contact us for more information. Entah kreativitas kreatif Anda atau pekerjaan seluruh tim Tetapi file-file itu sama sekali tidak berguna jika Anda tidak dapat menggunakannya atau membaginya dengan orang lain untuk bekerja sama. Inilah alasan mengapa dua tahun lalu kami meluncurkan Google Drive.